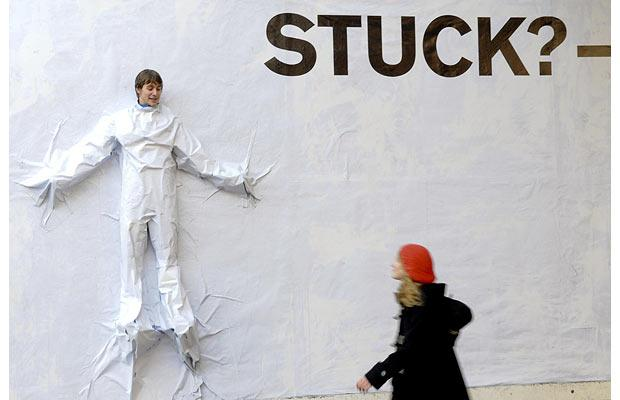 Who doesn’t hate the feeling of being stuck? Whether it’s stuck in traffic or stuck in a business meeting that doesn’t seem to be going anywhere, the experience of being captive can be excruciating. Frustration and irritation rapidly escalate when we sense that we are wasting our time and missing an opportunity to do something we want to do. The most psychologically damaging variation of the being stuck experience however, has nothing to do with commuting congestion or being subjected to death by Powerpoint. The worst stuck experiences occur when we find ourselves repeating old dysfunctional behaviors and habits we are trying, unsuccessfully, to change. These stuck experiences typically lead to a “I can’t believe I did that again” moment like eating the entire container of ice cream or yelling at the kids or drinking too much or being impatient with a loved one. I am not trying to put my EAP company out of business by proposing that behavioral change is a simple matter. It’s not, but like any other project, it’s a lot easier when you bring the right tools to the job. 1.Rehearsal. Being stuck means you have been here too many times before. So, in a moment of calm imagine, or talk through, how you would like to act differently in this situation. What would the best version of yourself like to do the next time? Imagine yourself acting this way. Rehearsal is a powerful tool and you don’t need to be an actor or athlete to call upon this technique. 3. Be very specific. When you are mentally rehearsing and imagining what you are going to do the next time you find yourself in the problem moment be rigorous and precise. Actors and athletes practice in a detailed way so that they are prepared for the emotional pressure that comes at the moment of performance or competition. The undesirable behavior you trying to change comes naturally and has already been repeatedly rehearsed. The behavior you are trying to substitute is new and it requires practice and repetition to become natural. 4. Celebrate the victory. When you successfully substitute the planned behavior for the stuck behavior stop to recognize and celebrate the moment. It probably felt unnatural (it was!) but that in no way diminishes your achievement. Now if we can just do something about the bleeping traffic congestion and pointless meetings. Well said and very good advice. Thanks! Thanks for your comment Leslie! It's much appreciated.